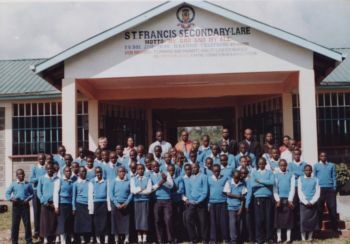 St. Francis Secondary School in Lare, Kenya was founded by the Franciscan Brothers of Galway, the same religious congregation that founded SFP. 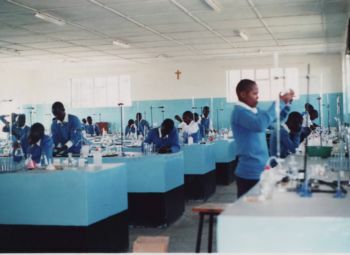 The school operates in the Catholic Diocese of Nakuru and the students come from very poor families. Several of the children were orphaned by the 2008 election violence but thrive despite adversity. 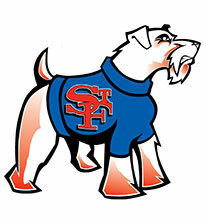 For the past six years, SFP students, faculty/staff, and families have rallied to raise funds to purchase: 60 bicycles for students who had to walk more than 5 miles (one way) to school each day, a new copy machine, a laptop and digital camera, textbooks, desks and chairs. To deepen our relationship with our friends in Kenya, we will again dedicate the proceeds from our Lenten T-shirt sales, Change for Change, and other contributions to buy 50 desks and 50 chairs, pay tuition or provide food for orphaned students. To donate a desk or chair or sponsor a child's tuition, please click here.